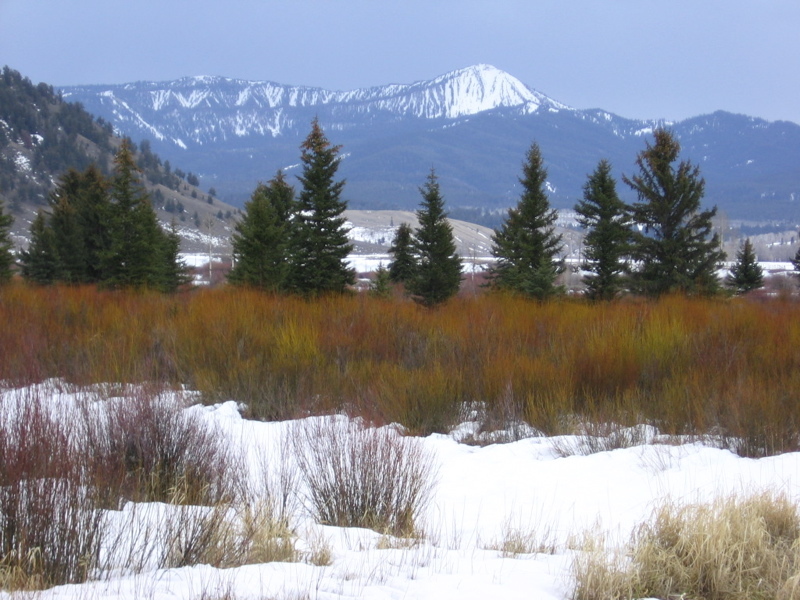 Willow communities are a fantastic food source for the elk and other browsing animals in Grand Teton and Yellowstone National Parks. In the winter, they turn many amazing colors, vivid against the white snow and deep green of the forest. 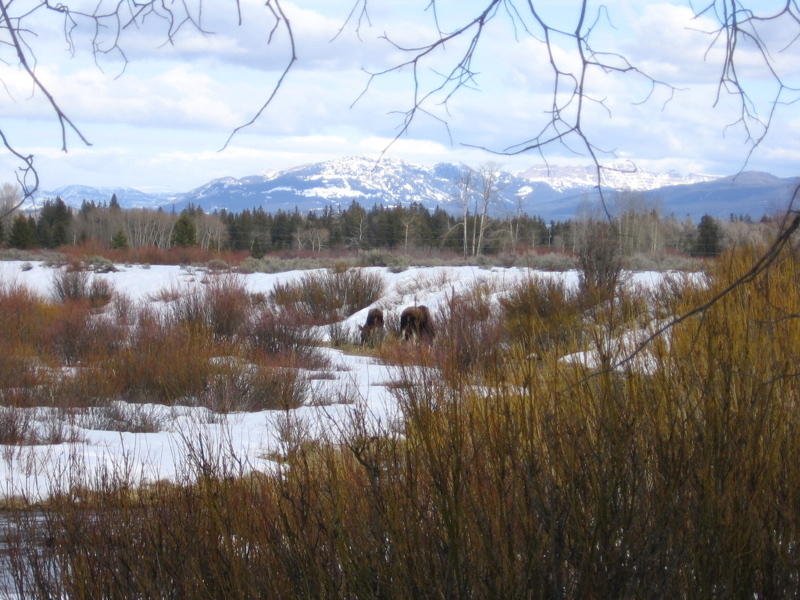 I watched as a mother moose and her yearling browsed and munched in the willows. In national parks, "bear jams" happen frequently during the summer months when millions of visitors descend upon the parks. If visitors see a bear while driving along, they stop abruptly, along with everyone behind them. Cameras click like mad, and some people even stupidly get out of their cars to try to photograph the bears more closely. Crowding a grizzly is never a good thing to do. 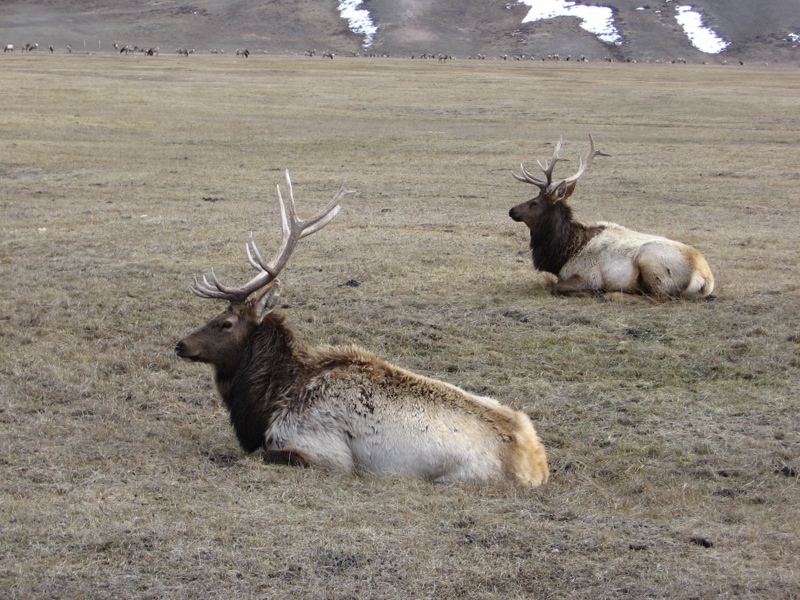 Neither is crowding an elk. 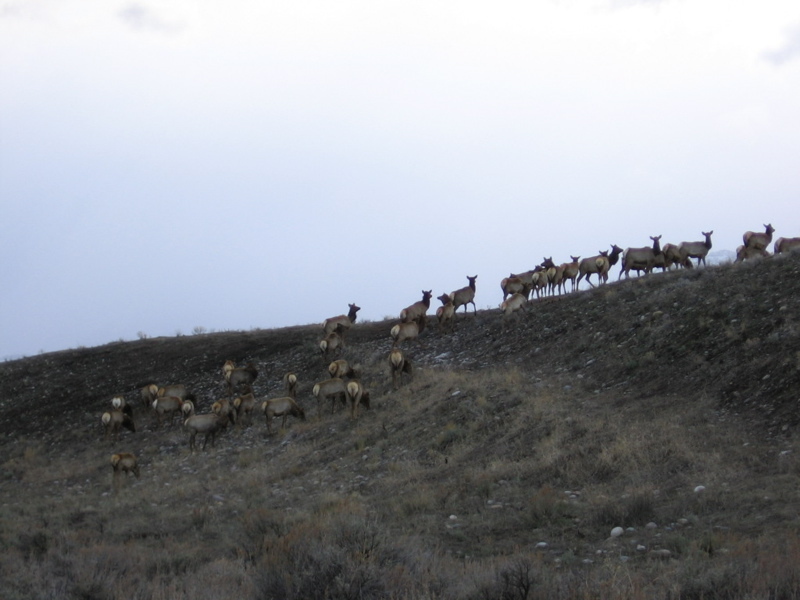 People have been gored by elk for getting too close. 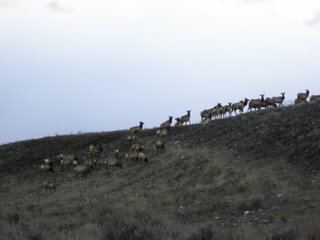 Just as "bear jams" occur, so too do "elk jams" as I just witnessed. 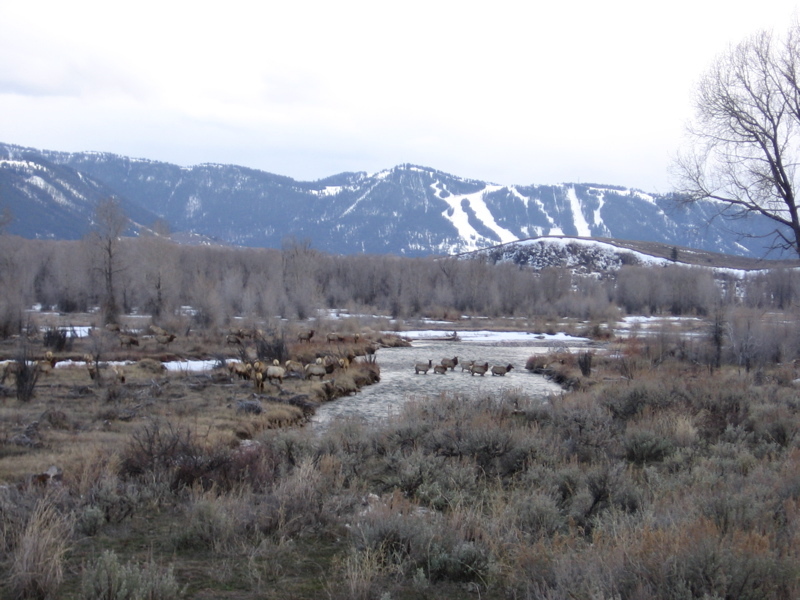 Hundreds of elk crossed an icy stream and then made their way across a back road in the park. Luckily, drivers were considerate, giving them plenty of space, and staying inside their cars. In 1927, a tremendous landslide swept down this mountain into the valley below and up the sides of the mountains on the other side. 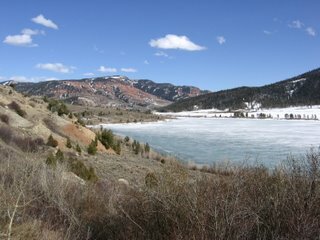 Named the Gros Ventre Slide, it dammed up the river below, creating Lower Slide Lake. 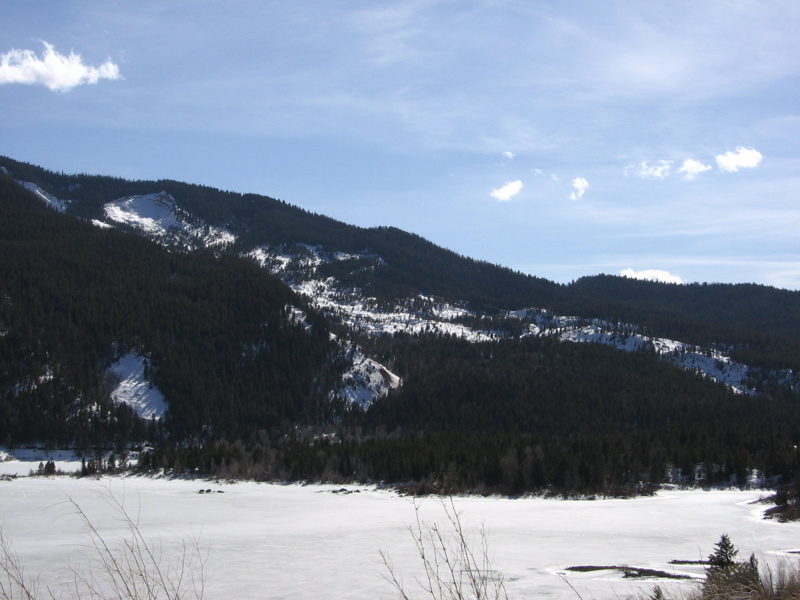 In the picture below, you can see where the tree-encrusted portion of land slid away from the mountain above, revealing bare earth (which is currently snow-covered). 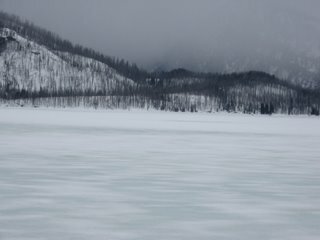 From the lake's edge, I watched as a coyote walked across the frozen lake, stopping to gaze curiously at trees sticking out of the ice. Nineteen moose. I saw nineteen moose today, browsing along the Gros Ventre River, some napping and others chewing peacefully in this gorgeous landscape of snow, rock, and forest. Jackson Lake is almost completely frozen over, a vast stretch of ice leading to the edge of the steep rise of the Teton Range. 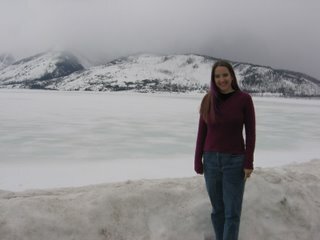 A cold wind picks up speed out here, and though the cold is biting, I see many tracks meandering across the snow on the lake's surface. 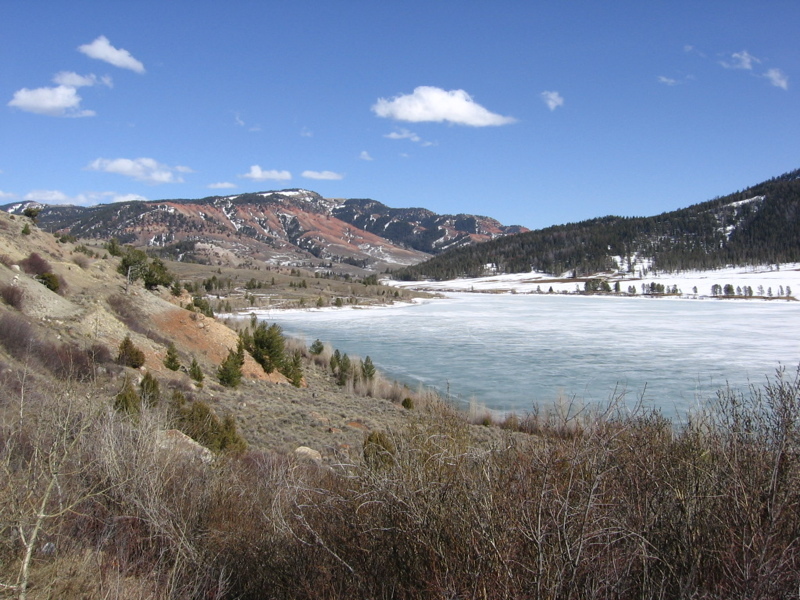 Coyotes, weasels, elk and deer -- they've all been traveling across the lake recently. 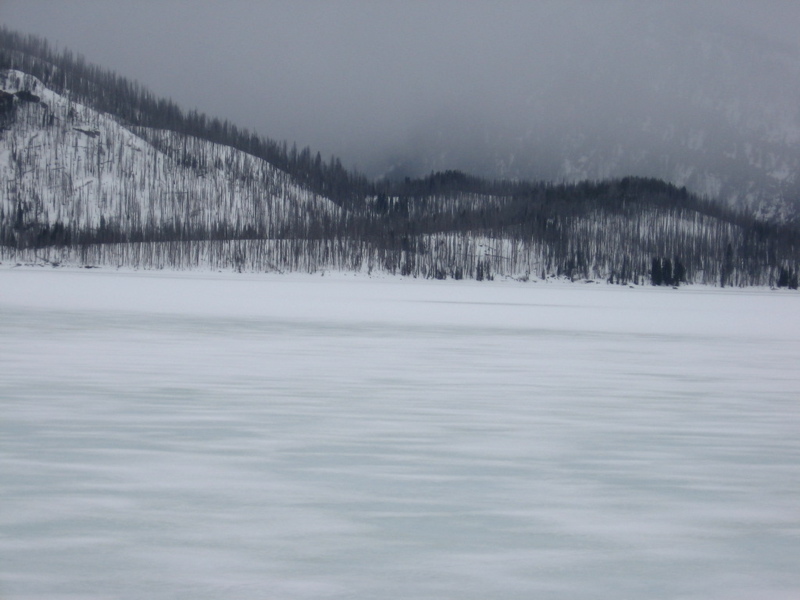 Today I watched over twenty endangered Trumpeter Swans gliding in an ice-filled lake, trumpeting and calling to each other, stretching their glorious snowy wings and arcing their graceful long necks. 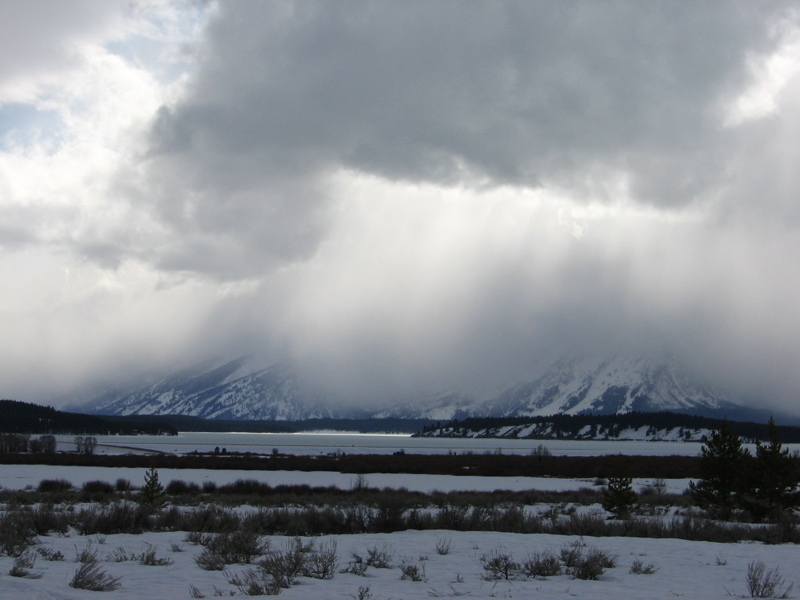 How magical this place is -- to be out here in the snow, watching storms roll in over the great peaks, and see so much wildlife. 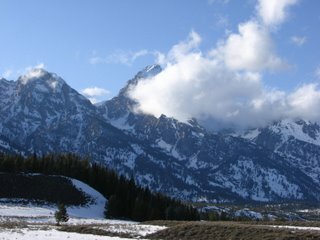 A wintering-over spot for much wildlife, Grand Teton National Park is absolutely teeming with moose, elk, coyote, bison and trumpeter swans right now. 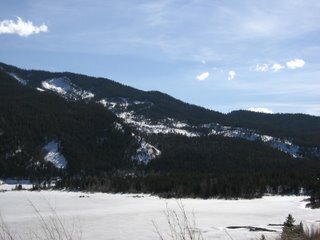 Glorious mountain bluebirds are just now returning to the park, looking for nesting sites. Their vivid blue, darting over snow-covered sagebrush, is a gorgeous sight. 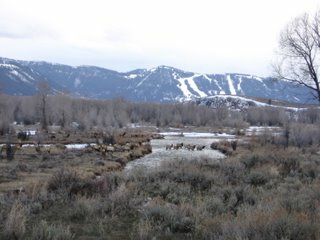 Thousands of elk nap and browse in the valley of Jackson Hole at the base of the stunning, jagged Tetons. 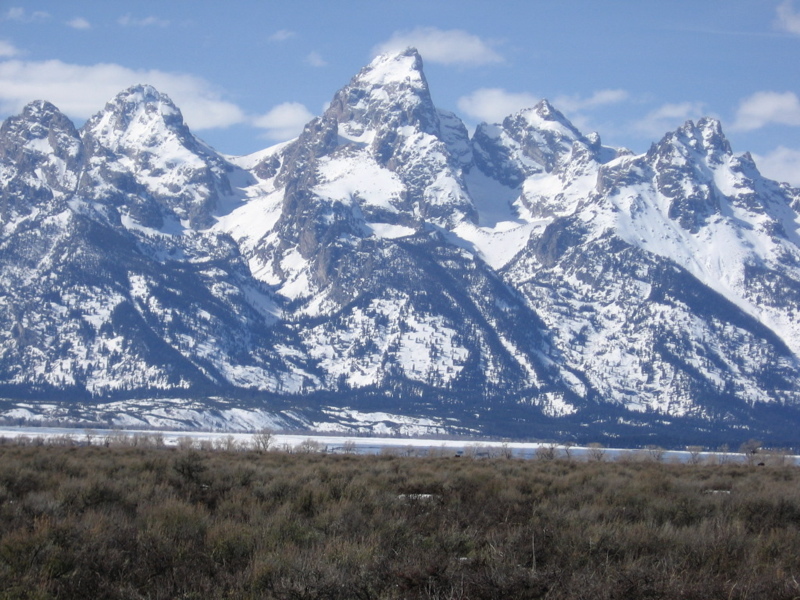 The Tetons formed with the Teton fault separated two land blocks, one block dropping (becoming Jackson Hole) and the other rising abruptly (becoming the Teton Range), which soars more than 7000' above Jackson Hole. 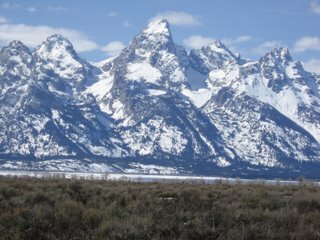 This happened recently, geologically speaking, only five million or so years ago, so the Tetons are startlingly jagged and unweathered, a gorgeous collection of crags, glaciers and steep valleys. 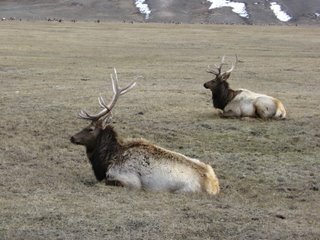 They are an amazing sight, partly because there are no foothills leading to their base. 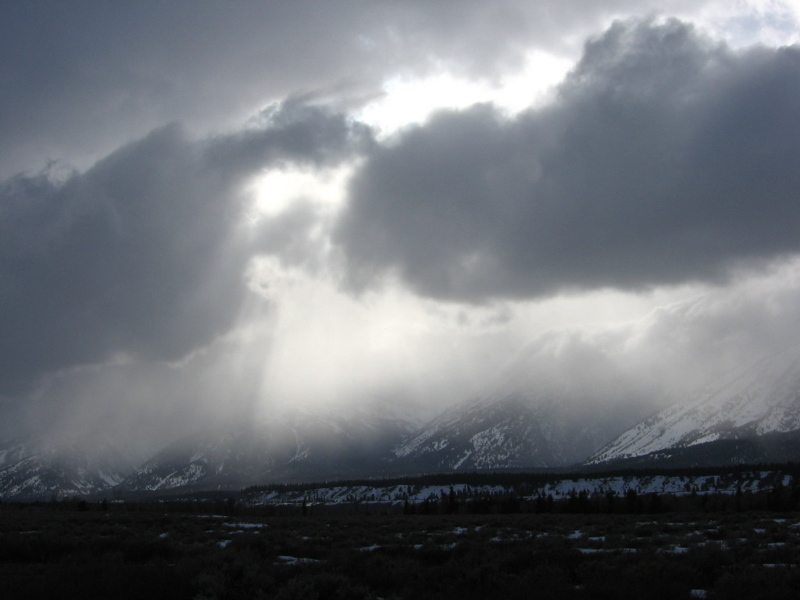 They rise steeply out of the sagebrush-covered land before them. Portal Through Time Nominated for Award! I'm excited to report that my novel, Portal Through Time, has been nominated for a Scribe Award. 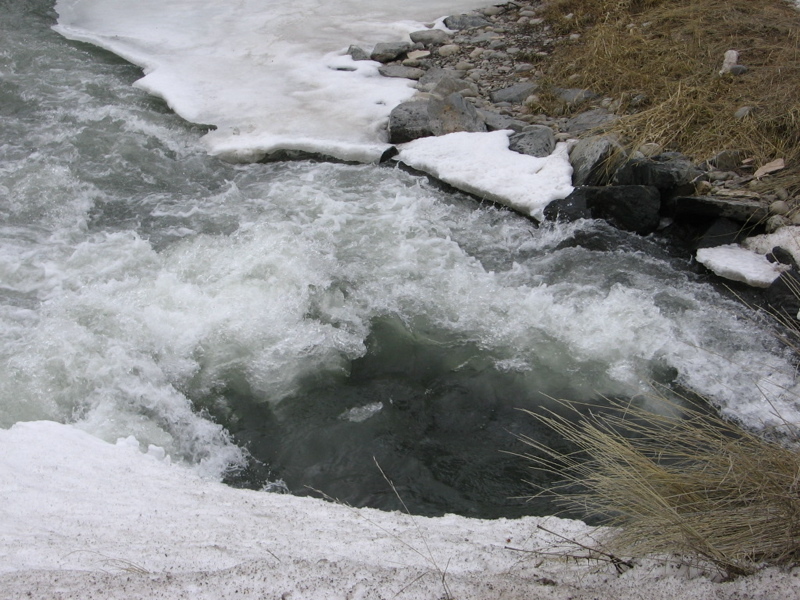 The news release can be found here. This annual award is presented by the International Association of Media Tie-In Writers, a professional organization of writers who all work with licensed material, from Buffy the Vampire Slayer to CSI to Star Wars and Stargate. It was founded by Max Allan Collins and Lee Goldberg and is a fantastic organization for people who write licensed fiction. For more info on the organization, please visit it here.